The Common Core State Standards for Mathematics Table of Contents includes two types of standards. First listed are Standards for Mathematical Practice. Second listed are Standards for Mathematical Content. Before we explore the Standards for Mathematical Practice (SMP), let’s make a distinction between the SMP and Content standards. The SMP are process standards. They are a part of the CCSS. Most states have had similar process standards. As process standards, the SMP are probably as good as any others. This table comes from slide 43 of a presentation at the Washington State School Directors Association conference in Nov. 2011. There are over 300 content standards in K-8. This above table presents one content standard and one of the Standards for Mathematical Practices. Here are the eight Standards for Mathematical Practice. The Common Core State Standards lead off with Standards for Mathematical Practice. The standards for mathematical practice rest on important “processes and proficiencies” with longstanding importance in mathematics education. The first of these are the NCTM process standards of problem solving, reasoning and proof, communication, representation, and connections. The second are the strands of mathematical proficiency specified in the National Research Council’s report Adding It Up: adaptive reasoning, strategic competence, conceptual understanding (comprehension of mathematical concepts, operations and relations), procedural fluency (skill in carrying out procedures flexibly, accurately, efficiently and appropriately), and productive disposition (habitual inclination to see mathematics as sensible, useful, and worthwhile, coupled with a belief in diligence and one’s own efficacy). To the casual observer, these words sound reassuring. For those who have been involved in the debate over how best to teach mathematics for the last two decades, this paragraph is extremely disturbing. NCTM’s process standards have been interpreted and implemented so as to downplay the importance of procedures and algorithmic involved in the debate over how best to teach mathematics for the last two decades, this efficiency in the name of “understanding”. It also favors finding more than one way to arrive at an answer that usually can be arrived at very simply in one way, and of eschewing word problems that provide the data that students will need to solve the problem in the belief that finding the data by themselves builds better problem solvers. We believe that the allegiance to the principles of the NCTM standards and ideology in Adding it Up will manifest itself in a student-centered, inquiry-based approach to math. We set out below attributes of the standards that are particularly weak and which lend themselves to such educational philosophy. As such, these standards in our opinion will diminish, not enhance, the mathematical proficiency and knowledge of students in K-12. Possibly a little too esoteric but the concerns expressed regarding these standards manifesting in more student-centered, inquiry based approach to math are being realized. Let’s take a close look at one of the SMP. 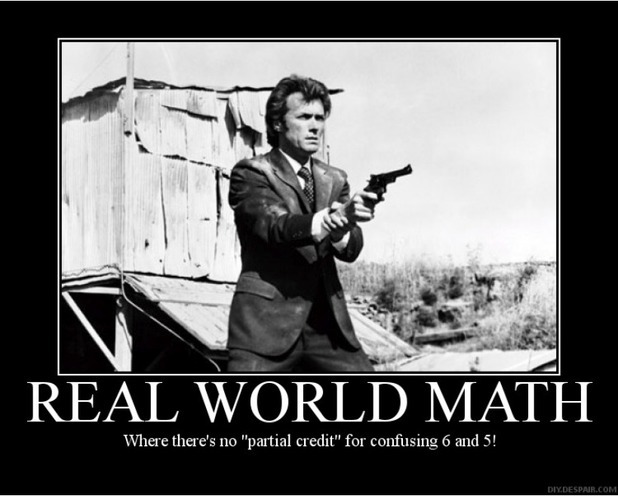 I have bolded the only phrase addressing accurate calculations. This does not come until the fifth sentence of the narrative. In the first sentence, “try to communicate precisely” is given a position of greater importance. While I am glad the writers thought to add “calculate accurately” into this standard, this standard appears to have more to do with attending to communicating with precision than calculating with precision or calculating accurately. Seven sentences… six related to communication, one about calculating accurately. How important is calculating accurately? What if the process of an inaccurate calculation is communicated precisely? And are you comfortable driving over that bridge or flying in that plane knowing that the engineers had great ability at communicating precisely about their inaccurate calculations? The focus on communication was a problem with the old Washington math standards and other state standards influenced by the NCTM standards. This looks much the same, just a tad more sophisticated. Hey, it sure does sound great though. 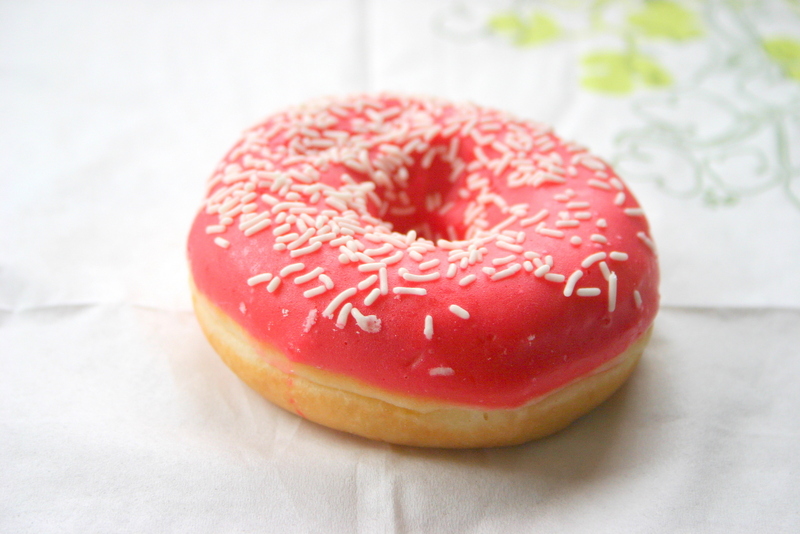 I’ll take a dozen… oh, there are only 8… that’s okay, I’ll still take a dozen. The focus on communication in the SMP may, in part, be the source or justification for the emphasis in asking students to explain the process they use. The ability to explain may be given greater importance than getting the right answer. For many math problems, the work students show should be explanation enough and is a great indicator of understanding. There has been a shift in math it seems. Answers to straight-forward math problems used to be either right or wrong based on their being a correct answer to the problem. That no longer seems to be the case and an answer is deemed to be right if a group of students reach consensus about it. Publishers of poor math textbooks/programs, professional development programs, and the SMARTER Balanced Assessment Consortium are emphasizing the Standards for Mathematical Practices (SMP) rather than the content standards. This emphasis on the SMP will influence local school district math textbook adoptions. The misguided but deliberate emphasis on the SMP rather than the content standards simply renders the CCSS as set of complex standards akin to the NCTM standards. The SMP flew in under the radar and few people were concerned about them. This emphasis will not serve the students across the country well. The emphasis placed on the Standards for Mathematical Practice supports a constructivist approach. This approach is typical of “reform” math programs to which many parents across the country object. Programs like Investigations and Everyday Math are able to claim they address the CCSS SMP. Publishers of reform programs are aligning their programs with the CCSS Standards for Mathematical Practice. The adoption and implementation of the CCSS will not necessarily improve the math programs being used in many schools. The emphasis on the SMP is driving professional development, textbook development, textbook selection and adoption, and assessment development. As a result of this emphasis, the SBAC may resemble a super sophisticated WASL rather than an actual assessment of student math skills. Many math professional development programs for school administrators and teachers are focusing on the SMP. What is taking place in your local school district? A couple of years ago I attended a meeting of math teachers at a middle school. None of the teachers had yet heard of the Common Core State Standards. The school principal was in attendance and was excited to share information about a seminar he attended the previous week. This principal distributed a one-sheet handout with the eight Standards for Mathematical Practice to the math teachers. He told the math teachers that these were the Common Core State Standards for Mathematics and this is what the school and the district will begin to focus on for math instruction. He gave no mention or indication of any awareness of content standards. These Standards for Mathematical Practice are what the school leadership has been told are the math standards and it is what leadership is telling teachers. Furthermore, administrators will evaluate teachers’ ability to deliver instruction on the SMP. Are the administrators in your local schools receiving similar training? 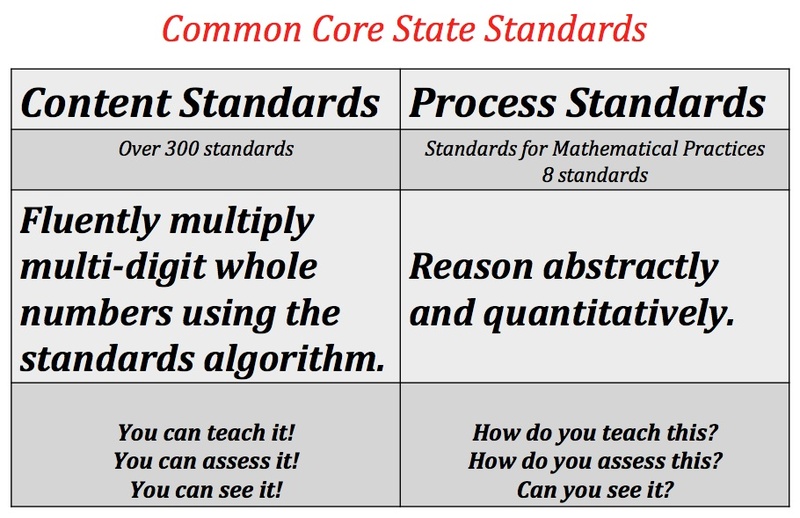 For those who find the CCSS math content standards to their liking, and possibly an improvement over their old or current state math standards, I urge you and everyone else to beware of the deliberate emphasis on the Standards for Mathematical Practice. Here are links to a couple of articles related to the emphasis on the SMP.